I made this quiche without cheese but you can add 1 cup of crumbled goat feta cheese if you like. For the crust mix all the ingredients in a bowl except water. This you should add slowly until you get the right texture. Then place the dough on a piece of baking paper and add another piece on top. With a dough roller roll out the dough to a evenly thin crust. Remove the top layer of paper and place the crust with the bottom paper in a quiche mold and bake for 3-5 minutes. Remove from the oven and set aside. Toss the sliced onion into a big pot and cook them over medium heat until they are soft. Then add the spinach and cook for another 5 minutes. Pour the onion mix into a big bowl and add the sliced beetroot and set aside. In a small bowl whisk eggs and milk together and then add to the veggies and gently turn the whole thing together. 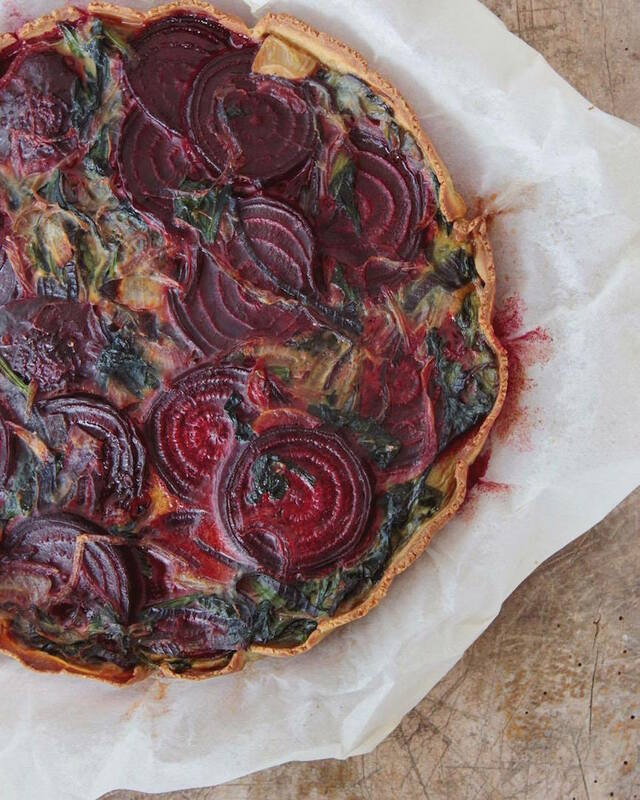 Pour the beetroot mix into the crust and let it bake for 20 minutes.